Three jam-packed weekends of rodeo activities are set for February at Kansas State University. According to Brooke Wallace, K-State Rodeo Club publicity chair, the Kansas State Iron Woman competition kicks off the action on Saturday, Feb. 6, with a bull riding school on February 12-13, and the annual Kansas State University Rodeo is February 19-20-21. Paige Wiseman of Paola won the Kansas State Iron Woman event sponsored by the K-State Rodeo Club last year and is expected to ride to defend her title at this year’s Iron Woman competition February 6, at Manhattan. All will be sponsored by the K-State Rodeo Club at Weber Arena on the north end of the Manhattan campus. Events, according to Staub, are to include cloverleaf barrel racing, goat tying, breakaway roping and team roping. “Contestants do not have to enter all four events, but a cowgirl must enter three divisions to be eligible for the Iron Woman title,” Staub pointed out. “Cowgirls may enter events multiple times, but it must be on a different horse, with the exception of team roping. However, the contestant must declare, before the event, which run is to count for Iron Woman points,” Staub said. 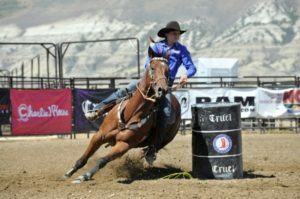 Last year’s Iron Woman winner Paige Wiseman, all-around cowgirl from Paola, is expected to compete to defend her title. There will payback for each event, and the Iron Woman winner will receive a custom made breast collar and $250, while the runner-up is to get a custom breast collar. “An open ribbon roping, according to National High School Rodeo Association rules, will follow the Iron Woman competition, with a stock charge, but all of the entry fees are to be paid back,” said Staub, who can be found on Facebook, or emailed at mstaub@ksu.edu. “The K-State Rodeo Club Bull Riding School on Friday evening, Feb. 12, and all day Saturday, Feb. 13, will feature professional bull rider Dave Samsel,” according to Casey Winn, coach of the K-State Rodeo Team and K-State Rodeo Club advisor, who is chairman of the bull riding school that is open to the public. Winning more than a million dollars as a professional bull rider, Dave Samsel will be featured at the K-State Rodeo Club Bull Riding School, February 12-13, in Manhattan. 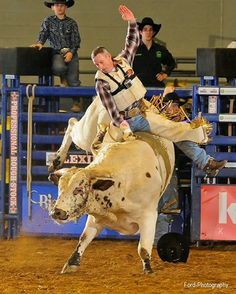 Samsel has competed in the Professional Bull Riders and Championship Bull Riding yearend finals events as well as qualifying and competing at the National Finals Rodeo sanctioned by the Professional Rodeo Cowboys Association. 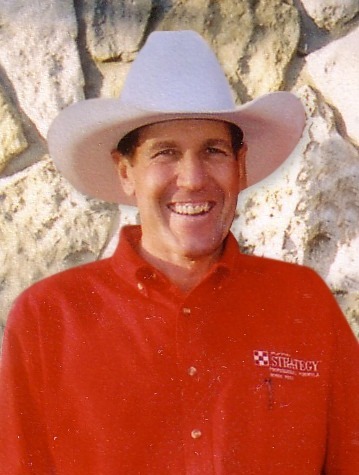 “Come learn from ‘Super’ Dave, the techniques and keys to success that he has used to win more than a million dollars at the highest levels of bull riding,” invited Winn, who can be contacted for details at435-681-0201, or email ccwinn@ksu.edu. Three days of action are set Friday, Saturday and Sunday, Feb. 19-20-21, for the annual K-State Rodeo, featuring college cowgirls and cowboys from throughout the Central Plains Region of the National Intercollegiate Rodeo Association, according to Wallace. Information on activities coordinated by the K-State Rodeo Club can be found at www.kstaterodeoclub.com.